TREAT held a field day here on 25th August 2012 to check out the 'Kickstart' natural regeneration trials being undertaken as part of the Making Connections project, led by the Wet Tropics Management Authority. 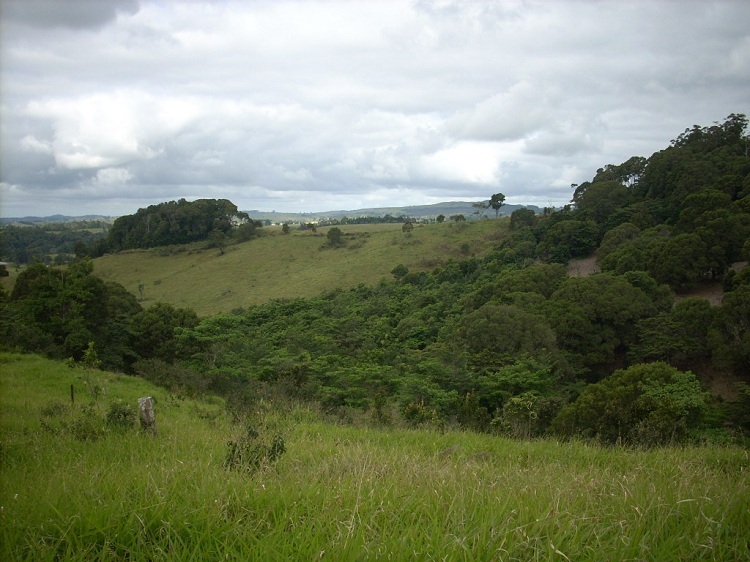 The purpose of the trials is to explore and assess a range of treatments aimed at stimulating the regeneration of rainforest in disused pastures. There have been quite a few changes in the intervening 2 years and the next phase of the trials is just starting. A range of treatments is being implemented on selected sub-plots and these include (a) the installation of electric fencing to exclude browsers, (b) suppression of tobacco by basal barking, and (c) transplantation of soil from nearby secondary forest. Professor Carla Catterall (Griffith University) will once again be on hand to explain the science behind the trials. 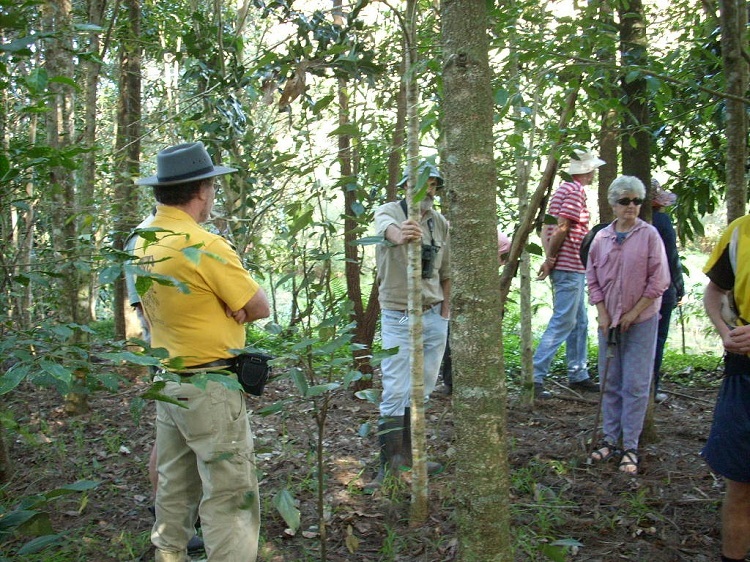 Cloudland Nature Refuge is located 8.5 km along Seamark Road, off the Malanda - Millaa Millaa Road. Parking at the property is limited, so car-pooling is necessary. Meet at 1.30 pm at the start of Seamark Road where there is plenty of roadside parking. The 32nd AGM will be held on Friday 5th September at the Yungaburra Community Hall commencing at 7.30 pm. Nigel joined TREAT in 1984 when the group had just 30 members. Since that time he has seen the emergence of tree-planting as a movement that crosses all parts of society, and its evolution into ecological restoration as a science. 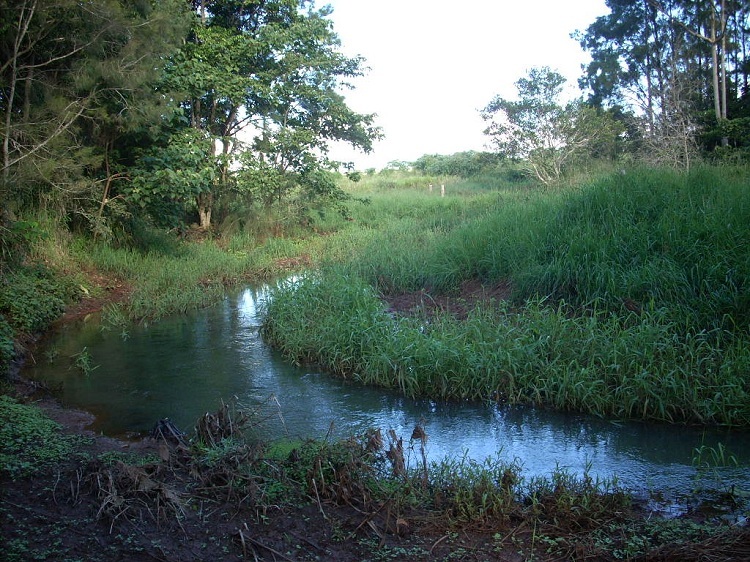 His talk will be a reflection on the development of ecological restoration in north Queensland. It will focus on TREAT, people, projects and places which have shaped this development, and the transformations to the local area landscape which have occurred as a result. The talk will also show how local ideas have contributed to positive changes in forest restoration practice, theory and policy across a much wider area, as well as highlight emerging issues and approaches. The last time TREAT members visited John and Marion Clarkson's property, Galaji, in 2010 they were shown a small experimental plot set up to determine whether deep planting could solve problems caused by bandicoots digging up trees soon after planting. 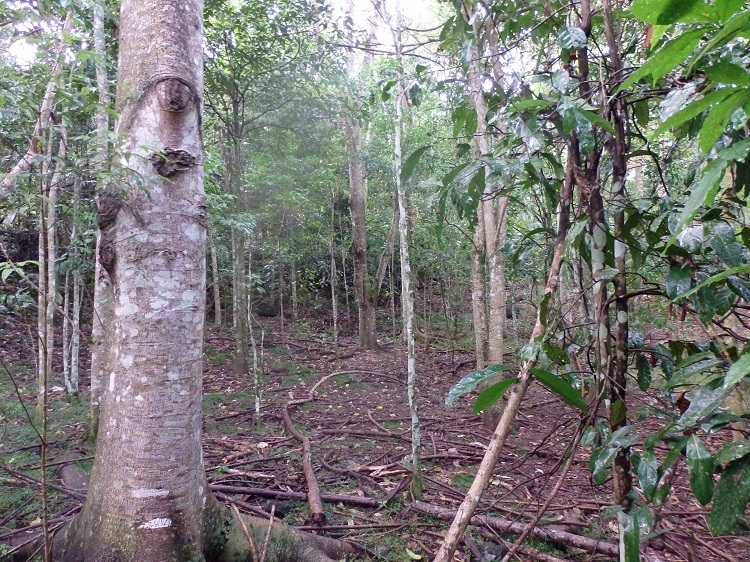 The technique has been successfully used with a range of species in southern Australia to reduce the effects of post-planting drought and wind, but does not seem to have been attempted in planting tropical rainforest species. It runs against the commonly held belief that plants should never be planted deeper than they are in the pot. Thirty species from 11 families commonly used in TREAT plantings were included in the trial plot at Galaji. These have now been in the ground for over 4 ½ years. The experiment has sparked considerable interest and there have been many enquiries about the results. On Saturday 27th September TREAT members are invited to come and see how things are progressing. When I wrote the previous article in this series, we were looking for rain and I was bold enough to predict some. Please don't blame me for the wet autumn we had. With the El Niño-Southern Oscillation in a state of transition towards El Niño and the Indian Ocean Dipole expected to remain neutral, it is likely that we will have a fairly normal late winter and spring, but the forecast reliability at such times is rather low. I hope your plantings are protected from frost. After last year's wonderful fruiting of the Lauraceae I doubt we'll see the same level of fruit available, which is a pity as Hypsie numbers are still recovering from the cyclones of the last decade and a second good season in a row would be wonderful. Hypsies are strictly diurnal marsupials which is a rarity. They eat mostly fruit but take fungi when fruit are scarce. Look for them around Eacham, Barrine and Danbulla where there are fallen fruit. It looks like a reasonable crop coming on some of the Water Gum, Syzygium gustavioides, which the Hypsies love. Have a look at the leaves of this plant for a wonderful example of intramarginal veins. Elaeocarpus grandis, Silver Quandong, had a good flowering and many trees have a reasonable crop which will be great to watch feeding pigeons and bowerbirds. The car park at Lake Barrine is a good spot for this. While there, keep an ear out for the difficult to observe White-eared Monarch. This little flycatcher works the canopy but in August they can be heard calling as they prepare to breed. 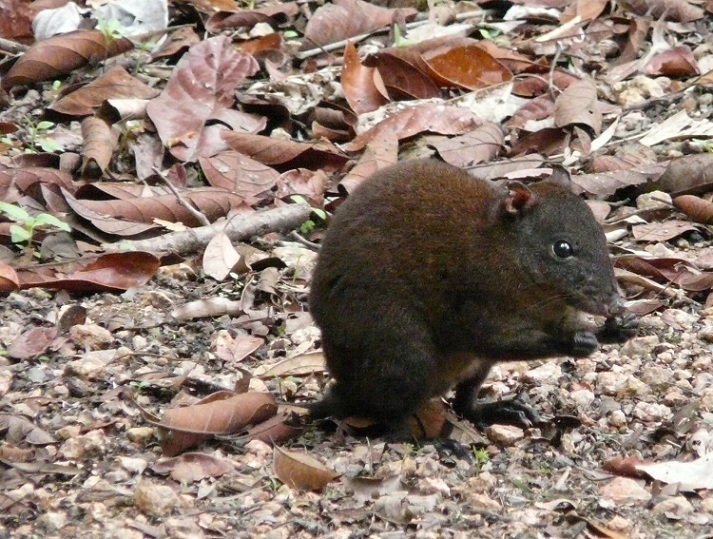 Musky Rat-kangaroo (Hypsiprymnodon moschatus) Photo Alan Gillanders. One quandong which did not fruit well last year but may have some during this period is E. largiflorens. This is a beautiful tree for the wetter areas of the Tablelands with a spreading shape if grown in the open, rusty-pink to white fragrant flowers in the early wet and fruit in the dry. Another plant for the wet areas of the Tablelands and fruiting over this period is Ayrtera pauciflora, Small-leaved Tamarind, which has purple new growth rather than the showy pink of the more commonly grown A. divericarta. This is also the time of year for collecting Davidson's Plums, Davidsonia pruriens, for jams, sauces and wine. Another native fruit tree worth collecting for food is Herbert River Cherry, Antidesma bunius. The fruit of this species can be anything from white to dark magenta and tastes like a tart apple. Peppers and Black Beans will be ripening during this period too. That sounds like a Central American recipe but please be generally careful about tasting fruit unless you are certain of the identification and its edibility. A good idea is to let someone else eat it first! Birds and even rodents have different digestive systems to us and can eat fruit which could be deadly to us. I am too busy at this time of year to attend your funeral! The unpleasantly smelly Elderberries will be flowering. The native one, Sambucus australasica, has only five or fewer leaflets while the exotic American Elder, S. canadensis, has at least five and many of the leaves are bipinnate. The native plant will produce yellow fruit while that of the exotic is black or nearly so. Watch the Candlenut trees as they develop a white bloom on their leaves before flowering. On clear moonlit nights they glow in the forest. I presume that this makes them more obvious to the pollinators which are likely to be moths. On the western edge of the rainforest, Eucalyptus tereticornus, Queensland Blue Gum, and E. grandis, Rose Gum, are likely to be flowering during this time, but the buds on E. tereticornis look well advanced at the time of writing so flowering may be finished by the time of publication. Harpullia frutescens, Dwarf Harpullia, has set fruit and will ripen soon. The flowers are small and pale brown but the scent is magnificent. H. pendula is also likely to be in fruit and visible on the tracks around the crater lakes. Watch the Tulip Oak, Argyrodendron peralatum for flowering and fruit set. 'Argyrodendron' means silver tree but the scales on the undersides of most species are more of a copper colour. The deciduous trees of winter will burst into leaf as the weather warms, but then in the Mabi forest watch for the leaf loss of Terminalia sericocarpa, before it produces its small smelly flowers which are attractive to flies and native bees. Interestingly this tree produces both male and bisexual flowers, the former being at the end of the short raceme. Small honeyeaters breed at this time of year, and the migrants which spend the winter with us start to leave. Currawongs and Satin Bowerbirds head back to the hills in August while Silvereyes and Bee-eaters head south. The large flocks of Silvereyes visible in winter are mostly visitors I believe, and we see smaller flocks of locals through the rest of the year. Already some Polyscias elegans have ripe fruit which is favoured by many bird species and a fruiting tree is a particularly good spot to watch for riflebirds and bowerbirds. As the season dries out, watch for Australian Bustards feeding in the grassed paddocks. Waterfowl which left to breed in ephemeral water bodies will be returning, and numbers of raptors are likely to increase. Alan Gillanders in the April-June 2014 newsletter wrote about noisy Coppery Brushtail possums in Mabi forest. He noted that it was the females making the noise as they repelled amorous males, which he thought was the reverse strategy to what usually happens, because of high densities. In my experience of watching marked Common Brushtail possums for many hours on the outskirts of Brisbane, it is the female who is screeching and grunting as she tells the male to back off, even at low densities. At the onset of the breeding season a male approaches the female as he attempts to overcome the one metre 'individual distance' only to be repelled by a screech. In the densities of my study area a dominant male would set up a consort relationship with a female. He would follow her, constantly approaching and giving a soft call, similar to that of a lost joey but deeper in timbre, only to be rebuffed. This could continue over a period of about 30 days at the end of which the female accepted the male and mating took place without any aggressive behaviour. At other times, however, and this is more likely in higher density populations, no consort period was established and the male, with the advantage of his larger size, would overpower the female to mate despite her resistance and much screeching. On any one night more than one male would attempt to mate with her so you can imagine the sounds emanating from the forest. This latter mating strategy could be the norm in high density populations in Mabi forest. Males will fight noisily to establish territory, but not often, because once dominance is established between neighbouring males they use scent marking of special features, such as den trees and frequently used feed trees, to claim ownership. 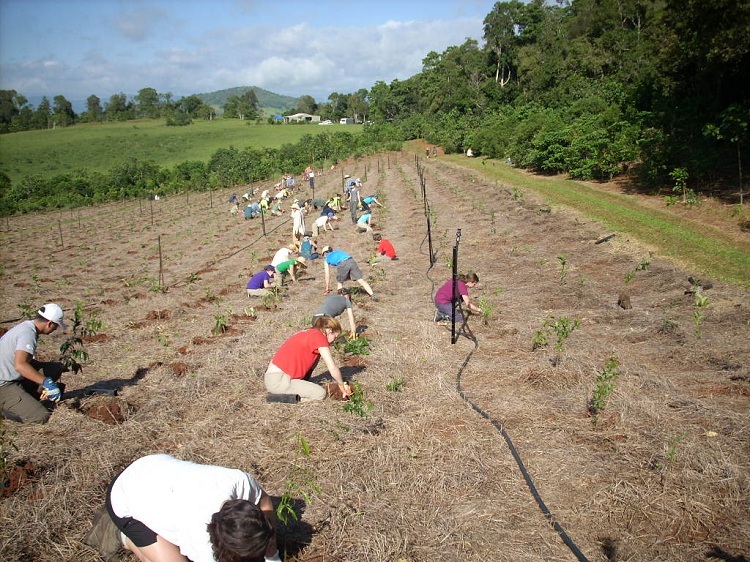 The following is a glimpse into our family's first attempt at planting a small patch of scrub on the Atherton Tablelands. It has been most rewarding, and as for many truly satisfying things, much of this has been due to good people and a little effort. We have learnt a few things along the way, and are hopefully a little less naive and more pragmatic than when we began. Bron and I met while working in Gympie - me in agriculture and Bron in natural vegetation management. We both love the bush and after a stint in New Zealand were fortunate to get employment on the Tablelands. It soon became clear to us that we would like to put down some roots, so we started looking for some land where we, hopefully, could raise a family. A real estate agent took us to the top of Halloran's Hill and showed us the remnants of an old dairy farm - a paradise of Guinea grass, Japanese sunflower and lantana with a few forlorn horses. 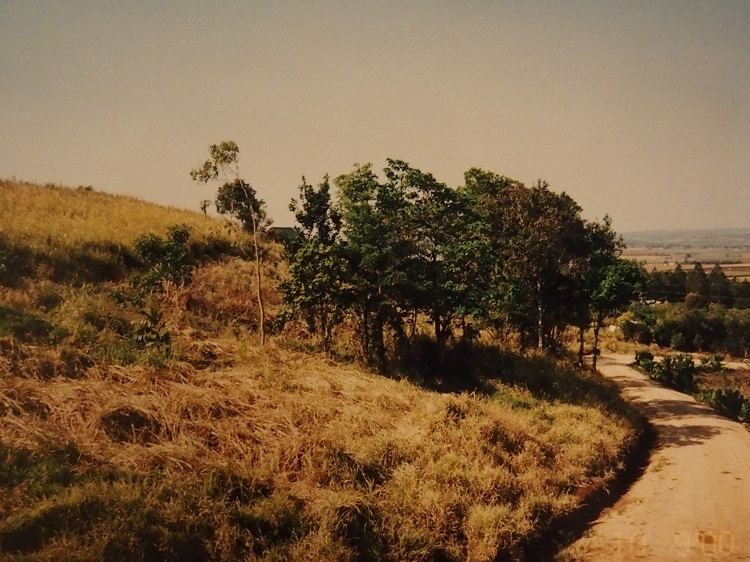 The block was, however, close to the Mabi forest environmental park and contained a few small (10-20 m across) remnant patches where it had probably been considered too rocky to clear for pasture. Bron was hooked - I took some more convincing because I could see the work ahead. We bought it and quickly began to plan what to do. The block consists of rocky basalt gullies and slopes with relatively deep, fertile soils (containing vesicular basalt rocks) in between. It made sense to us to link to the environmental park with an additional area of Mabi forest.We decided to plant the gullies and hill slopes, while leaving the more fertile, flatter areas for growing food and building a house. This would mean planting about 3 acres of forest, leaving the rest for vegetables, fruit trees and farm animals. Luckily, we both had fairly useful (if relatively inexperienced) skill sets, with Bron working in catchment care and later, rainforest revegetation, while I enjoy growing food, seeds and pasture plants. It would be nice to say we did things using 'best practice', but that would be far from the truth. We began to collect seeds of Mabi forest species (from just about anywhere we saw a flowering tree), potting them up by the hundreds and raising them while living in a small unit in Atherton. There was no particular plan to strategically use pioneer species, although these were well-represented in the collection. Whilst these were growing, I began to tackle the lantana and Japanese sunflower jungle with a mattock and we had some fantastic bonfires. Once removed, we were left with a sea of Guinea grass up to 2 m tall. Our first plantings were poorly conceived. The trees came from Helen Adams, who was then Bron's boss and a good friend, and we decided to spread them (at about 40 m spacings!) across the top slope of the block. We also planted them in August because it always seemed to be wet! It is no surprise that these areas took a huge amount of maintenance to survive the dry season (bucket-watering) and subsequent wet seasons (weed control). Astonishingly, many survived and are some of our largest trees today. The following plantings became more conventional, based on some good local advice. Smaller areas were prepared for planting each year and we concentrated on working along blocks defined by geology (down a gully, or across a slope). We only cleared what needed to be planted that season, leaving enough time for weed control in the older plantings. In most years we planted about 500-800 trees, spaced at about 1.5 m apart - much like TREAT plantings. The mix was better now, with pioneer species (bleeding hearts, mallotus) scattered throughout the plantings, and we planted only during the Wet applying a little organic fertiliser to each tree. Weed control also improved, and I found the best method was to allow the Guinea grass to grow to 1+ m during early storms, cut it with a brush-cutter about 4 weeks before planting and spray the regrowth with glyphosate. This killed over 90% of tussocks and provided a deep mulch layer which lasted throughout the first year. Glyphosate and a 5 litres hand sprayer was all that was needed to keep the plantings clean. The plantings had to fit into our working and family-starting lifestyles (Bron can still remember the frustration of not being able to plant trees because of being too pregnant with our first child). We had to become more efficient and smarter as we had more areas to plant and more to maintain. I fell into the routine of planting 30 trees every night when I came home from work, so could plant 150 in a wet-season week comfortably. After about six years, 5000 trees, one house and two kids (another came later), we had somehow planted a patch of scrub. We are hardly making great steps in improving biodiversity - it is, after all, a small patch of young rainforest partly isolated (across a park) from another isolated patch of rainforest and does not comprise a full component of Mabi forest vegetation. We have, however, noticed changes, particularly over the last few years which make us think some small steps are being made. There is now deep litter, and thanks to Cyclone Larry, new pioneer species are coming through (including stinging trees, which saw me off to hospital one evening!). The pioneer species have been fruiting for years, some have died, and slower growing trees are growing through. Quandongs, figs, tamarinds, Bumpy Satinash and maples have all begun to fruit. We no longer see Indian mynahs or currawongs, instead robins, fig birds, scrub turkeys and orange-footed scrub fowls. Red-legged pademelons have moved in, as have brush-tailed and green possums (yet to see a tree-roo) and pythons keep the chooks alert. Weeds are no longer a problem as the shade is too dense. You could well argue that we planted our forest for purely selfish ends - we love the bush and had the first-world opportunity to grow some rainforest mostly for our own pleasure and to provide easy management of difficult-to-manage areas like gullies and slopes. Perhaps the best part for us has been the interaction between the forest and our kids (now 8, 6 and 3). They explore it, have a platform in it and get to see the animals regularly and at first hand. Bron has also used it to source food and habitat for wild-life rescue. The forest does add to the Mabi forest on Halloran's Hill, providing additional habitat. The forest also raises questions. For example, it would be interesting to know how long it takes to create a 'useful' forest or how much carbon we have sequestered in trees. Also, what makes it 'feel right'? Perhaps this is all a bit philosophical. Suffice to say, to all you tree planters - we are hooked too! Each Wet Season, students from the School for Field Studies help TREAT at the Community Plantings. Who are these students and what is the School for Field Studies about? The School for Field Studies (SFS) was started in America in 1980 when some universities were adding environmental studies to their curricula. It was a time when people were becoming aware of the need to sustainably manage the world's remaining natural resources. A small group of people met in Boston to establish an educational organisation which would address the need to inform and prepare the next generation of environmental leaders. In 1981 they sent 75 students into the field and the organisation has progressed from there. Over the years, programs have operated in a total of 20 countries and SFS today is acknowledged as having the premier environmental study abroad program for undergraduates. Over 80 colleges and universities are affiliated with SFS and more than 15,000 students from the US and abroad have participated in their programs. SFS have permanent, fully staffed field stations in Australia, Costa Rica, Kenya and Tanzania, Panama, and the Turks and Caicos Islands. At these places they run Semester programs of 12 weeks, twice a year, during America's Spring and Fall seasons. They also run Summer programs of 4 weeks duration in these and other locations. Students enrolling in programs need to be at least 18 years of age, of good academic standing and have completed at least one college-level ecology or biology course. They receive academic credits for having completed a program, the courses for which are approved by the University of Minnesota. 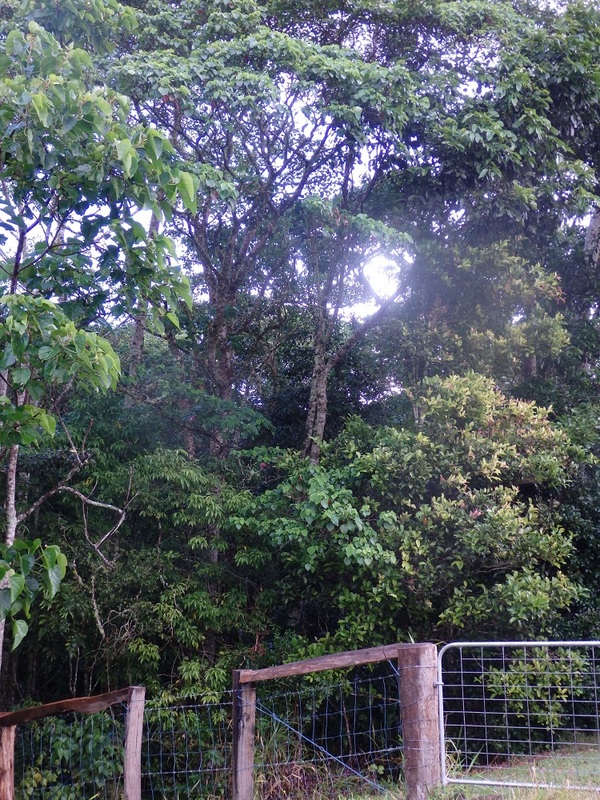 A Centre for Rainforest Studies (CRS) was opened in Queensland in 1987. Initially situated near Millaa Millaa, it moved to near Yungaburra the next year when SFS purchased property near the top of the Gillies Highway. Here the students live in cabins in the rainforest and have classroom lectures and meals in a central building. Much of their education is conducted in the field and their program includes camping out at Chillagoe and studying the Daintree rainforests. There is a strong emphasis on community engagement and cultural exchange, and TREAT sees this when the students come to the nursery on Fridays and attend our plantings. They are enthusiastic and keen to learn about rainforest restoration and TREAT's involvement. Approximately 30 students take the program each semester, but only about six students at a time visit the nursery to take part in the activities. At the community plantings, all the students come to help and we are always very grateful of their presence, particularly if there are patches of difficult terrain, which never seem to be any trouble to the students. At the end of their stay, the students have a Community Night in Yungaburra where they present their Directed Research projects as posters, and showcase 3 or 4 of them as Power Point presentations. It is always an interesting night as their research is relevant and useful. Some of the local community host students on a Homestay weekend and are invited back to the Centre on a special American day such as Thanksgiving. This gives us more time to interact with the students and staff and is most enjoyable. Last year the SFS obtained trees from the nursery and planted an area on their property to celebrate 25 years there. At that planting TREAT members were able to give back some of the help we'd received over the years. This year a Director from the US came to a small ceremony there to mark the occasion and in April the planting was extended. The 'Spring' semester students helped community volunteers at six plantings at the beginning of this year and, to quote their Centre Director, "Students arrived to find rainy weather, muddy conditions and a welcoming party of leeches but this doesn't seem to have dampened their spirits any as they got underway with their introductory classes, field excursions and exercises." The SFS and the students are a huge asset for the local community. The afternoon began with the promised tree-kangaroos - two of them sitting, watching the growing group of people beneath. Doug explained that he and Sandra had bought the property in 1978 and soon realised they needed a wind break. So in 1980 they turned to the Queensland Forestry Department who supplied Caribbean Pine, Tallowwood and Rose Gums. None of these grew naturally on the site and none did particularly well. A couple of years later Greening Australia assisted with more tree planting under and around the wind break but again the species selection was poor and not native to the site. By 1985 Doug and Sandra had joined TREAT along with son Simon and so began a strong association between the Burchill family and TREAT, with Doug and Simon being long time committee members and Sandra cooking barbecues at plantings amongst other contributions. Simon took over from Doug and led the group of 35 down the road, following the line of the wind break to a point where we could see the Peterson Creek Wildlife Corridor stretching to the east towards Ian Freeman's property and on to Lake Eacham. Two green ringtail possums briefly distracted us before we headed into the first of several creek bank plantings assisted by TREAT, this one in 1998. A good canopy had formed and many small seedlings, natural recruits, were establishing themselves. Simon commented on the abundance of casuarinas but explained that many problems had arisen in the original planting such as inundation by the creek, frost, clay soils and cattle intrusions. He looked at which species survived and found that the casuarinas were about the only one that did well in these conditions so planting it in large numbers to establish a canopy became the top priority and biodiversity would come later. TREAT obtained Federal Government funding for a larger planting in 2004 and followed this up with large scale in-fill following losses to frost and inundation. A little way in we found Simon's latest weapon in the battle against the poor soil conditions - two compost heaps, in varying stages of breaking down. Simon told us that getting as much organic matter as possible back into the soil to improve aeration and soil health was now his aim and it seems to be working. 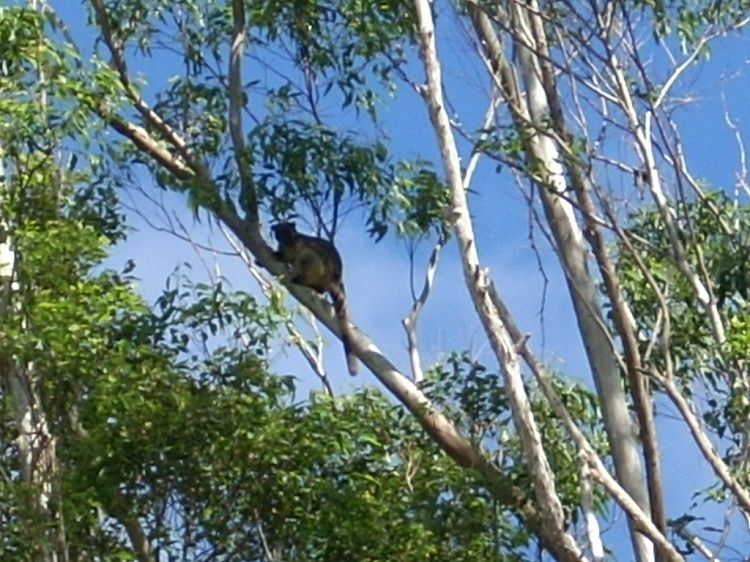 Another tree-kangaroo and a third green ringtail possum showed up to remind us of how the wildlife corridor was already being used even though it isn't quite complete yet. The creek now flows through a defined channel instead of a blanket of para grass and eroded banks are being held by tree roots - all going to show that tree planting really does improve water quality. Afterwards we headed up to a new shed for afternoon tea catered for by Barbara Lanskey and Sandra Burchill where we were able to chat and absorb the afternoon's findings. To sum up my own thoughts on the work done here, I think of how TREAT plants many trees and arranges for maintenance to clear weeds, and we expect the trees to reach canopy closure in three years. We hope that other factors such as frost, inundation, cattle intrusion and poor soils do not impact on the growth of the trees, therefore delaying canopy closure. Here, the landholders have actively found ways to mitigate the damage from many threats and continue to nurse this important patch of the Peterson Creek Corridor through tough conditions. We applaud their efforts and congratulate them on their success. In November 2013 the State Government's Minister for National Parks, Recreation, Sport and Racing (Hon. Steve Dickson) notified TREAT that we had been successful in our application for a grant of $25,000 under the 'Friends of Parks' Small Grants Program. 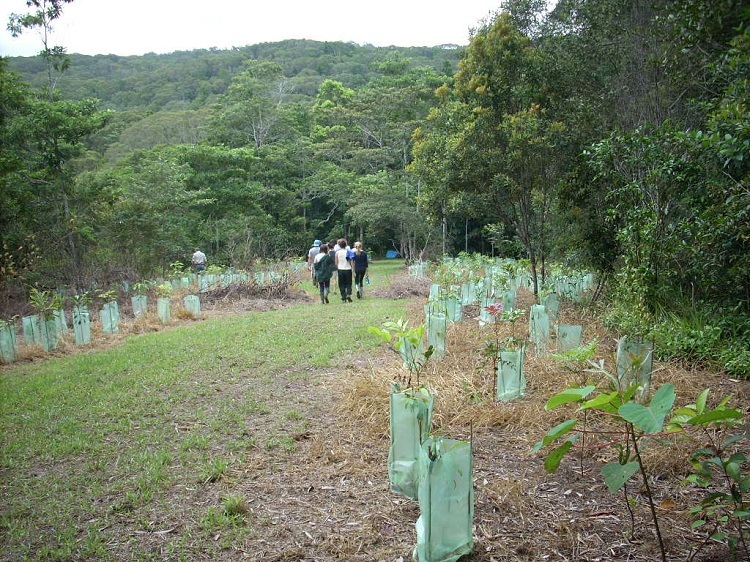 Our application was titled 'Improving Health and Safety Work Practices for Volunteers at the Revegetation Nursery, Lake Eacham' and the grant was to improve conditions for the volunteers and staff by replacing old infrastructure with new. By the time the application was approved by the government (in this case six months), the quoted prices from firms, valid for 30 days, had risen and we had to furnish the shortfall. Fortunately we had TREAT's Environmental Benefit Fund to take up that balance. Now the weather is drier, we are gradually painting the stands before they go into service. Meanwhile, all other items are in service. Our grants secretaries, Alison and Michael, are continually looking for grants. If you come across any that may benefit TREAT and its goals, please let them (or any of the committee) know. On Saturday afternoon 19th July, TREAT held a field day at Mark and Angela McCaffrey's property, Ringtail Crossing, on Kenny Road. 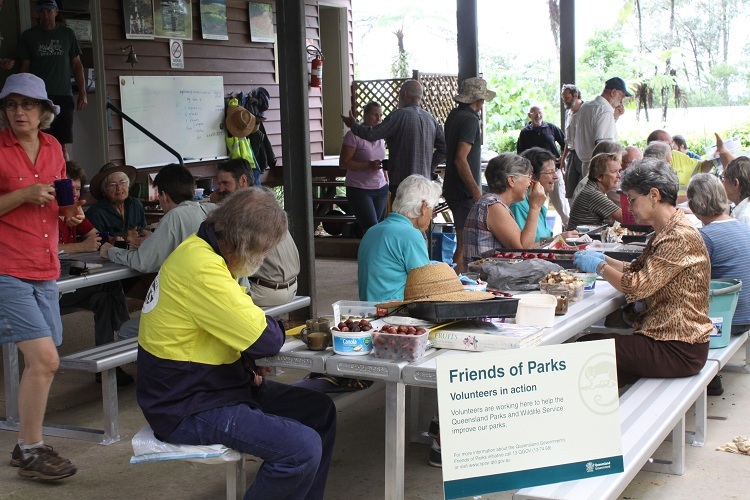 Thirty-seven people came to see the work that Mark and Angela have been doing to create a corridor across their property, linking a large privately owned remnant of forest (on several properties) to the Herberton Range National Park. Starting with some small plantings in 2004, they have now planted 23,300 trees with help from friends, TREAT and Conservation Volunteers Australia. Much of this has been possible through their successful funding applications, firstly with an Envirofund/NHT2 grant and then with the Vegetation Incentives Program (VIP) and more recently with a Biodiversity Funding grant. Thankfully the VIP funding was for 5 years and the Biodiversity Funding also for 5 years, which allows for maintenance of the plantings. There are still two years of plantings to add another 7000 trees to the corridor, after which Mark and Angela can relax somewhat, having achieved their recent aim - to widen the corridor to a substantial 200m. Angela and Mark led us on two loop walks, the first in the nearby revegetated area. The plantings exhibit terrific growth and where they had achieved a low canopy closure we followed in single file as one can easily lose a sense of direction. We looked at some gully edges where Mark continues to spray Lantana and Guinea grass to gradually extend the revegetation, then back near the shed Angela talked about the seedling recruits. She broadcasts seed where she thinks they'll have a good chance of germinating, particularly on edges where they'll extend or enhance the existing vegetation. Bigger seeds such as Water Gum (Syzygium gustavioides) she covers with a scraping of soil. When she notices a special seedling growing, it is marked with a stick and either tape or some marker paint on the stick. This allows her to avoid spraying it when she is spraying generally for weeds. She also transplants Gingers (Alpinia arctiflora and A. modesta) and the rainforest grass, Oplismenus undulatifolius. These are obtained from either disturbed roadside areas or from the creek next to their intact forest area. The Dianella we saw comes up naturally. On the second loop, as we walked down the driveway, Mark pointed out a Commersonia bartramia growing next to an Alphitonia petriei. They have noticed this pioneer growing well on the property's poorer soils. We stopped at the original plantings in 2004, around a small remnant, and then moved on to the 2013 planting which has suffered from wind exposure. Here the plants are not performing as well and will take longer to achieve canopy closure. Some have died and been replaced. Next to the latest planting this year, there was a long strip of young tobacco trees and grass, which looked out of place considering Mark's detailed attention to maintenance. 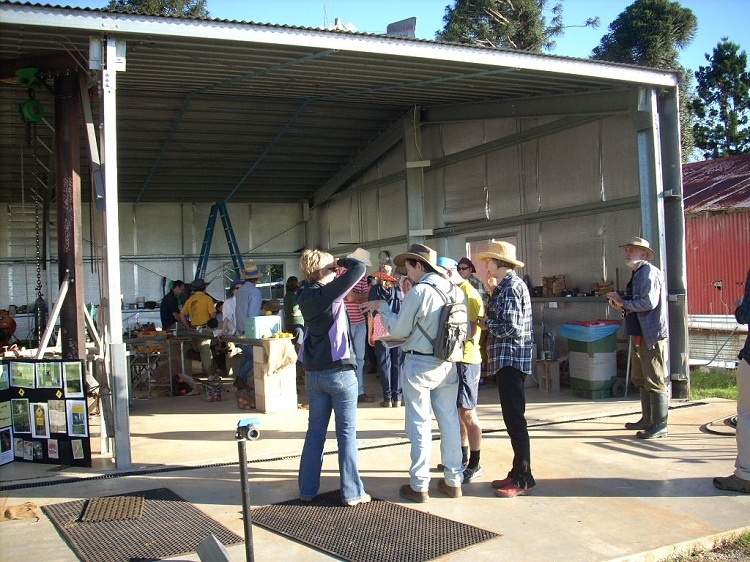 Carla Catterall, from Griffith University, who was at the field day, explained they formed part of her 'Kickstart' trials - see her article in TREAT NEWS Jan-Mar 2013. The new plantings have substantial guards around many trees and these are the species the pademelons love to graze. Interestingly, Angela noted that they don't seem to graze the natural recruits. Back at the shed, we had cake, sandwiches and cheese platters to go with our tea and coffee, and I found myself talking to people I hadn't met before - some had come from Mareeba and Cairns and others from a nearby property on Kenny Road. It was a great afternoon and it was a pity it had to eventually end. The cooler months have seen a marked change in activities at the nursery with very few trees going out since May, as is the norm. Seed collections have been down, with some weeks having little or nothing available despite on-going collection trips. Collections are expected to increase over the next month or two. Peter has been kept really busy and has done a tremendous job dealing with pest and disease issues in the nursery. Continual wet and cool weather has created ideal conditions for fungal pathogens, with Rhizoctonia fungus affecting many species and causing significant damage to young plants. Attack from sap sucking and tip boring insects has also been on the rise through this period. With very limited opportunities for chemical treatment of pests and diseases due to wet weather, the only option has been to prune damaged tissue and excess foliage from affected plants, and spraying when possible. Many batches of affected plants are showing early signs of recovery and most plants are expected to recover fully when warmer and drier weather returns. Darren returned to the nursery in mid-June following a secondment to QPWS Tinaroo Work Unit, where he assisted with Capital Works projects, redeveloping the campgrounds at School Point and Kauri Creek. TREAT needs some new people to help with catering at wet season plantings. At present we have two catering teams who alternate at the plantings. Some of the volunteers on the current teams are finding they can no longer attend the plantings, and other volunteers would like to be more involved in actually planting the trees. If you can help in preparing and serving out the food at the barbecues, please let us know. Call Ken on 4095 1208 or contact any of the committee - phone contacts are on the back of this newsletter.